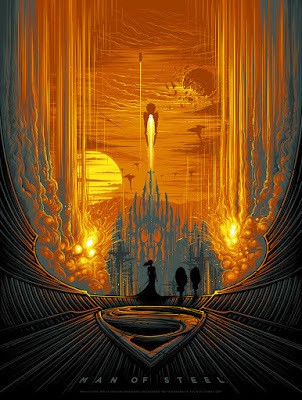 Check out this beautiful new Man of Steel movie poster by artist Dan Mumford and French Paper Art Club! I don’t think the destruction of Krypton has ever looked so majestic. It’s an interesting take on Zack Snyder’s much derided film, and yet a very important (albeit tragic) moment in Superman’s life. Man of Steel by Dan Mumford is an 18”x24” signed and numbered seven color Superman screen print. Limited to just 180 pieces, collectors can purchase this officially licensed DC Comics movie poster now at the French Paper Art Club online store for €45.